At the RGU Imaging Center, we understand that any exam or scan can be intimidating, especially if it’s your first time. Our well-trained staff are committed to making your visit as smooth and as pleasant as possible, starting with helping you arrive prepared for your CT scan. A CT scan, sometimes called a CAT scan, is a computed tomography scan that uses X-rays to capture detailed images of specific areas of the body. This helps doctors more clearly identify any health issues and allows for early disease detection so they can provide you with the best treatment plan possible. 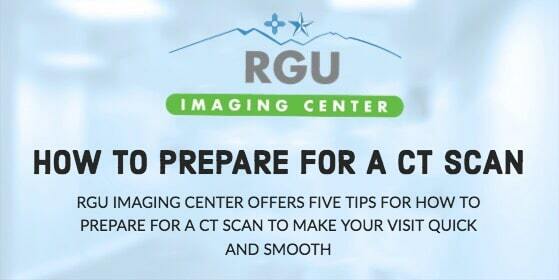 Before you arrive for your appointment, you’ll receive specific instructions on how to prepare for a CT scan. Following these directions closely will move you more quickly through the process, and more important, will help us support your health and wellness through clear, quality image captures. Wear comfortable clothing that’s easy to change out of should you be asked, depending on what part of the body is being scanned. Avoid wearing, or prepare to remove, any metal objects such as jewelry and belts. Avoid eating 3-4 hours before your scan. Your doctor may also give you instructions to avoid drinking liquids as well, depending on what area of the body is being scanned. Check with your doctor for specific instructions. Expect your exam to take about an hour, but allow for a little extra time should any unexpected delays or technical complications occur. The scan itself should only take 15 to 30 minutes. Relax! Our expert team is here to walk you through the process and make you as comfortable as possible throughout your visit. Please contact us if you have any questions before you arrive for your scan. CT scan results will help you and your provider determine the best treatment for your condition. We will guide you each step along the way so you know exactly what to expect as you prepare for your CT scan and after the results are in. Do you have a symptom or condition you have been trying to ignore? The compassionate physicians and staff at RGU are here to walk with you through whatever you are facing. Call us today at 915-225-2020 to set up an appointment or contact us here.